Just over a month ago, we told you about Gerald Scarfe's current exhibition at London's House of Illustration. Now running until February 10th, "Gerald Scarfe: Stage & Screen" looks at Scarfe's varied work for stage and screen. It's a rare opportunity to explore the extensive but little-known production designs by the celebrated political cartoonist. Storyboards, costumes and props are on display from Pink Floyd's The Wall, Disney's Hercules and English National Ballet's The Nutcracker. To mark the final weeks of the exhibition, the artist himself is appearing this month - January 18th, at 7pm - to give some personal insight into the works on display – many of which are being shown for the very first time. 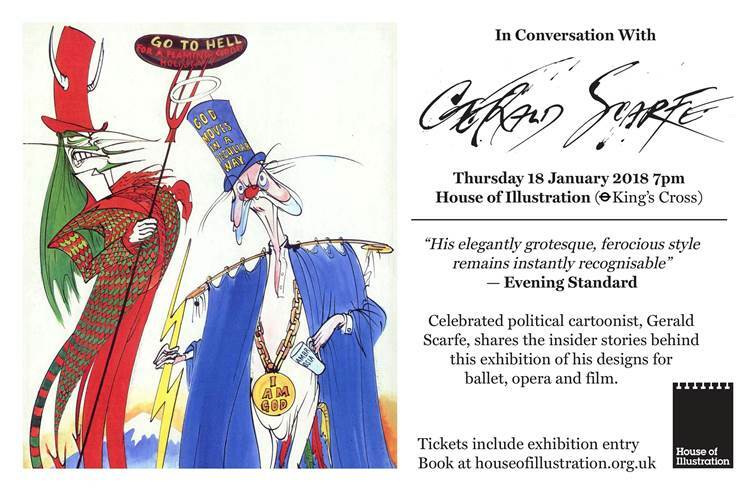 Join Scarfe in conversation with Colin McKenzie, Director of House of Illustration, as he shares the stories behind the works and gives a personal insight into Gerald Scarfe: Stage and Screen. Find out more about the extensive but little-known production design by the UK's most celebrated political cartoonist. Tickets for the interview include exhibition entry. To book for this event, visit houseofillustration.org.uk/whats-on/current-future-events/in-conversation-with-gerald-scarfe to secure your ticket. We understand that there is a fair amount of Floyd-related material on display amongst his work for other projects, so should definitely be worth a visit next time you are in London, even if you are unable to attend the talk itself. More details, and to book tickets, visit HouseOfIllustration.org.uk. The venue is open 10am - 6pm Tuesday through to Sunday, and is just around the corner from King's Cross railway station.